In recognition of Sexual Assault Awareness Month (SAAM) this April, we are asking individuals to start a fundraiser on their facebook page for the month and select Women’s Advocates as the organization they’d like to support in recognition of SAAM. By participating in the #SurviveTogether campaign, you will help us reach new supporters who can easily contribute a gift of any size to a meaningful cause, ensuring we can continue our critical work with survivors of abuse. We will ensure each participant has clear directions on how to take part. Not only is this a way to raise funds for our critical work, but also a way for YOU to share vital education information and resources specific to Women’s Advocates, domestic violence, and sexual assault throughout SAAM this April with your friends and network. 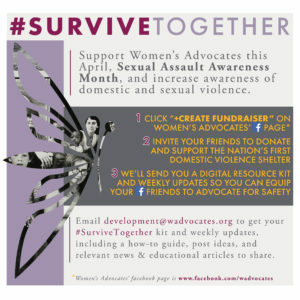 Contact development@wadvocates.org if you want to take part – we will send out a kit of information via email at the end of March to get you started as well as weekly updates and news relevant to SAAM and #SurviveTogether.